Taking a break is often harder work than staying home. You want to see this, do that, go there. For our recent four day break we wanted just that – a break. But how do you do that with children? I decided to try a country cottage nestled alongside the Mapleton Falls National Park. Normally we’d do a beachside unit, but that can be exhausting when you’re the one lugging boogie boards and cleaning sand out of everything. Mapleton Falls Farm Stay sounded like far less work. The farmhouse had the basics including a fully stocked pod coffee machine, which was a pleasant surprise. For entertainment there wasn’t much more than a television, a stereo and some aging board games. There was also the promise of bushwalking, cows, egg laying chickens and a shaded swing in an old tree to keep the kids amused for hours. As promised the cows were friendly and delighted the kids with their eagerness to be handfed. 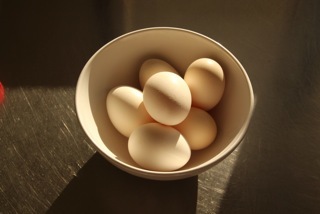 The three chickens produced half a dozen warm, white eggs. And the swing was great for pushing the boundaries of daring as well as for contemplative rocking. The bushwalk on offer was only a very short track, the Wompoo Circuit – enough to keep everyone interested for an easy half hour walk. When they’d had enough of that there was always a comfy couch and iPods to listen to – or the massage chair, which was another unexpected luxury and a great place to read! For a family wanting to get away and really relax, Mapleton Falls Farm Stay was a great option. At less than two hours drive from Brisbane, it’s easy to access – and somewhere our city kids can go ‘free range’ for a while. This entry was posted on Wednesday, October 16th, 2013 at 6:35 pm	and tagged with Farm stays, Life, Mapleton, short breaks, travel and posted in Australia, short breaks, Travelling with kids. You can follow any responses to this entry through the RSS 2.0 feed.